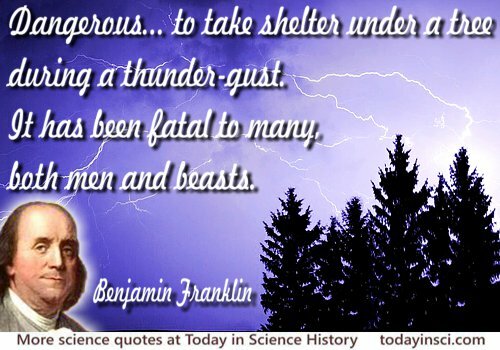 Dangerous, therefore, is it to take shelter under a tree, during a thunder-gust. It has been fatal to many, both men and beasts. 'Letter IV. Containing Observations and Suppositions towards forming a new Hypothesis, for explaining the several Phænomena of Thunder-Gusts', in Experiments and Observations on Electricity, Made at Philadelphia in America by Mr. Benjamin Franklin, and Commnicated in Several Letters to Mr. P. Collinson, of London, F.R.S. (1751), 47. In the book, the letter is undated, but it is printed after a footnote dated 29 Apr 1749, and is followed by one dated 29 Jul 1750. Therefore, it is assumed by later authors to have been written in summer 1749. When I. Bernard Cohen editted Benjamin Franklin's Experiments (1941), 209, he wrote that the letter was wrtten during summer or autumn of 1749 and “was dispatched, not to Collinson, but to Dr John Mitchel F.R.S." In his later books, Cohen dates it as 29 Apr 1749.